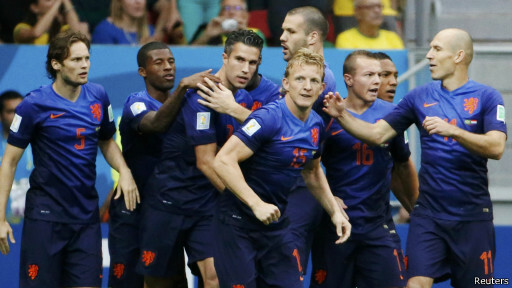 World Cup 2014 third place campaign result Brazil 0 Netherlands 3. This is the bad moments for Brazil national team. After the heavy defeat against Germany in the Semi-Final a third place should be theirs, however Netherlands and Louis van Gaal still giving their best even though the Dutchmen also feel how unfortunate they are not in the final. Robin van Persie open the score for Netherlands in the third minute. Robin's goal in the match make him joined the third place of World Cup 2014 top scorer with Neymar Jr. and Lionel Messi. Daley Blind add the tally in the 16th minute, and Wijnaldum close the match scoring the third goal for Netherlands in the 90th. Netherlands was not playing very well in my opinion. Their key player Arjen Robben who inspired the counter attack was mark tightly by Brazilian defender. Everytime Robben get the chance to run with the ball Fernandinho/Paulinho (sorry can't remember the name) forced the Bayern winger down to the ground. Felipe Scolari will be the one to be judge after the bad result Brazilian had. The recent dance of samba showed by Brazil palyers is way from the meaning of entertaining and way to awful. Hulk, Fred, Oscar, and Ramirez are Brazilian top players in Europe but in their national team they cannot play as a team. Neymar dependency also become Brazil weakness, and after this bad result Brazilian people will curse Scolari and Fred because leaving the experience and (personally) passionate player like Kaka. Robin van Persie, Louis van Gaal, Frans Hoek, and Marcel Bout will soon join Man United pre-season training in United States of Amerika.